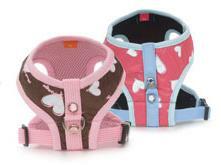 Waterproof and definitely gorgeous, this Puppy Angel Heart Milky Soft Harness Collar and Leash Set is made from nylon covered in quirky hearts. The edges are trimmed in plain blue binding while the mesh lining ensures the ultimate in walking comfort. The chest is adjustable and the strong strap down the back holds the D-ring with a blue rhinestone either side for attachment of the tangle-free leash which is included.